The 6 Remix: Neutral Gray Plaid Blanket Scarf for Fall. Today I am back with a "6 Remix" type of post. I do these posts every now and then where I show you how to mix 6 different pieces into 6 different outfits or one piece (like today) into 6 different ways. Today, I decided to style a must-have Fall Accessory (more than an accessory I'd say): the Blanket Scarf. My Pinterest feed and Thursday Moda linkup have been full of them in the last month or so and several bloggers have done posts where they have showed different ways to style them, too. But most of the ones I have seen styled different ways, are the colorful plaid blanket scarves or the ones with reds and creams. I wanted to show you how to style a Soft Neutral Blanket Scarf for a pretty warm Fall. My Scarf is a Neutral Gray (with white) and it seriously goes with so much! All 6 of these outfits were shot on November 6th. I meant to actually compile this post that day but it ended up being a busy Sunday and when I had some free time I decided to spend it with Vivian and enjoy our gorgeous warm sunny Sunday instead. I ended up wearing the Distressed Denim Layered Outfit during the day and the one with the Red+Navy Plaid Dress in the evening that day. A few days later I also wore the outfit with the Sweater and Aztec Skirt, to work. But I will be honest, there haven't been many days where we have needed to bundle up with warm blanket scarves thus far, this Fall. The few times I have used mine, I have used them as a jacket or poncho rather than around my neck. I even showed you an outfit with a Blanket Scarf on Monday which you all loved. In today's post, for all the outfits I have focused mostly on the clothes rather than the jewelry. I only have a necklace on the first and last outfit, for example. And I have worn my Camel Leather Block-Heel Sandals a few times this Fall when it has been in the 60s and 70s. 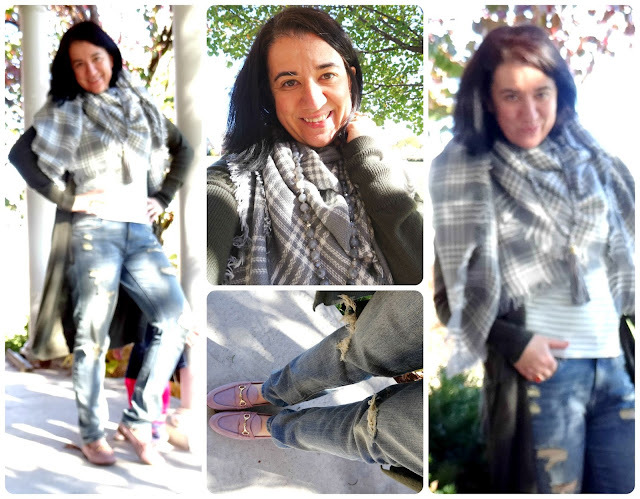 Here is my 6 Remix post with my Neutral Gray Plaid Blanket Scarf, today (finally). And on each widget I have featured a different Gray Plaid Blanket Scarf, lots of options for you to browse and/or buy! Take a peek! Neutral Gray Plaid Blanket Scarf with Layers and Distressed Jeans. This is what I'd say is a typical Fall Mom Outfit on a busy day, running errands, chasing after a toddler. It is comfortable, put together and the kind of outfit you can take layers away from, when you get warm. I paired the scarf with a White+Gray Striped Lace-up Tee, a Long Olive Green Cardigan, Light Wash Distressed Blue Jeans and my Blush/Light Pink Suede Loafers. I also accessorized/layered the blanket scarf with a matching Ombre Gray Tassel Necklace by Jacket Society. Vivian was being her sassy and happy self and wanted to be in some of our photos. Gray+White Striped, Ribbed, Elbow-Sleeve Lace-up Tee: Target.com (New) (quite similar, Great Deal, my Favorite), (similar in black+white, Steal), (similar, on Sale, love this). Olive Green, Long, Open-Front Cardigan: Old Navy (New) (identical, comes in several colors, love these!! ), (similar w/ pockets, on Sale, my Favorite), (similar in cashmere, Splurge). Light Wash Distressed Blue Jeans: Express (New) (similar current option, Great Deal), (similar, love these), (similar in ankle-length, Splurge, my Favorite). Long "Y" Beaded Gray Necklace w/ Suede Oversized Tassel (comes with earrings): Jacket Society (New) (similar current option by Jacket Society), (very similar, Huge Steal), (similar, Steal). Neutral Gray Plaid Blanket Scarf with Black+White Striped Sheath Dress and Bright Floral Pumps. I love mixing plaid with stripes. One of the best way to do that with a blanket scarf is with a striped dress. Since the blanket scarf is loose and bulky, it would look best with a Fitted Striped Dress, like a sheath (as I did here). This look would be perfect for work with the addition of pumps since booties are more casual and should be more weekend-appropriate here. I decided to add a third pattern and pop of color with my Gorgeous Teal+Hot Pink Floral Pumps. You can try a Plaid Blanket Scarf with a Striped Button-Down Tunic and Skinny Jeans (plus Booties or Boots) for a more casual look. Black+White Asymmetric Striped, 3/4-Sleeve Cotton Jersey Sheath: Spenser Jeremy (New) (similar, on Sale, love this), (similar w/ faux leather trim, Great Deal), (similar, Splurge, my Favorite). Canvas, Blue+Hot Pink Floral D'Orsay Pumps: Merona via Target (New) (quite similar, Splurge, my Favorite), (similar, Great Deal, love these), (similar, on Sale). Neutral Gray Plaid Blanket Scarf with Bird Sweater, Aztec Black+White Mini Skirt and Cognac Block Heel Sandals. For this styling I paired my Gray Plaid Blanket Scarf with other Neutrals. 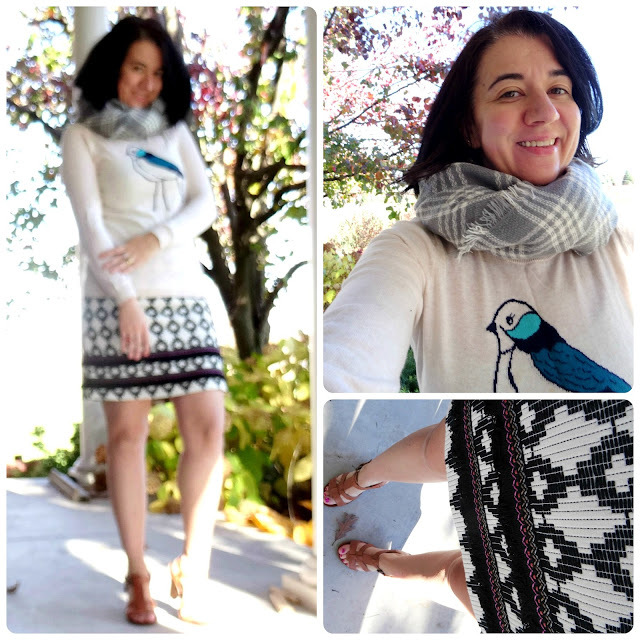 I chose an Intarsia Bird Sweater I have had on my closet for 3 years and still love and an Aztec-Print B+W Mini Skirt in a thick Jacquard material I recently got on clearance for under ten bucks. Beautiful Animal Sweaters like mine are so IN this Fall. Loft has several right now and I want them all, especially the kissing penguins and the festive reindeer. For this Outfit I wrapped my Cozy Scarf into a Chunky Snood. Looked so cozy and this outfit is also quite festive for Thanksgiving and/or Christmas. If it is cold, were Heeled Booties (either Cognac or Black) and a pair of Black Tights. Oatmeal/Ivory Intarsia Sweater w/ Turquoise+Cobalt Bird: Old Navy (similar in black, Great Deal), (similar, Great Deal, love this), (similar in cowl-neck, on Sale, my Favorite). Black+White Jacquard Aztec Mini Skirt w/ Black Fringe Trim: Merona via Target (New) (similar super mini, Steal, love this), (similar, Great Deal, my Favorite), (similar mini). Neutral Gray Plaid Blanket Scarf Belted with a Brown Belt over a Blue Chambray Dress paired with Cognac Block Heel Sandals. 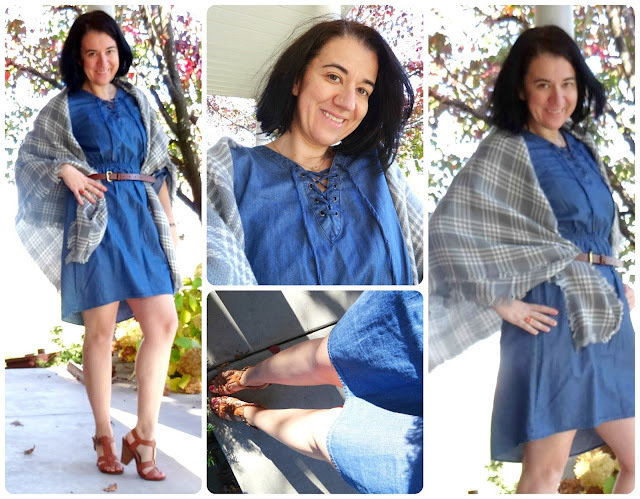 Here I paired my Neutral Gray Plaid Blanket Scarf with a Chambray Dress in a medium wash. I wore the Scarf as a Poncho and belted it. The Belt is brown but it pairs well with the Cognac Sandals. Such a simple but put together look. Once again for cooler weather, I'd wear tights and boots, booties or OTK boots. This look would be great for Thanksgiving dinner because it is casual but chic and allows for a big meal lol. Medium Wash Blue Chambray/Light Denim Reversible-Sleeve Dress w/ Lace-up Neckline: Mossimo via Target (New) (similar, Steal), (similar w/ fun pockes, love this), (similar, on Sale, my Favorite). Brown Faux Leather Skinny Belt w/ Gold Metallic Square Buckle: Old Navy (New) (similar, Huge Steal, love this), (similar w/ intricate design, Steal), (similar, Splurge). Neutral Gray Plaid Blanket Scarf with Fuchsia Mini Dress, Cropped Black Velvet Blazer and Fuchsia Bow Stilettos. With this outfit I had the upcoming holidays in December and all the festivities, in mind. This dress is short but I think it would be fun to wear for a Cocktail or Dinner Holiday Party with friends, something at a fun or fancy restaurant. The Fuchsia Mini Dress even has some sequins on the collar. I matched it with Fuchsia Suede Bow Stiletto Sandals I recently just got at Banana Republic. The Cropped Black Velvet Blazer makes it even more holiday-like. I used the Scarf as an accessory over one shoulder but if you get cold, wrap it on your shoulders over the blazer. Also, for warmth and modesty, you can add some Black Opaque Tights to this outfit, too. Fuchsia/Magenta Mini Soft Jersey, Sleeveless Dress w/ Sequined Collar: Express (Old) (gorgeous option w/ sleeves, on Sale, my Favorite), (halter style in hot pink, Huge Steal, love this), (elegant ruched option, Small Splurge). Black Cropped Velvet Blazer: Wal Mart (Old) (very similar, Splurge), (similar, Great Deal, love this), (similar, regular length, my Favorite). Magenta Real Suede Stiletto Sandals w/ Bows on the Ankle: Banana Republic (New) (similar, Great Deal), (similar in royal blue, my Favorite (similar, Splurge, love these). 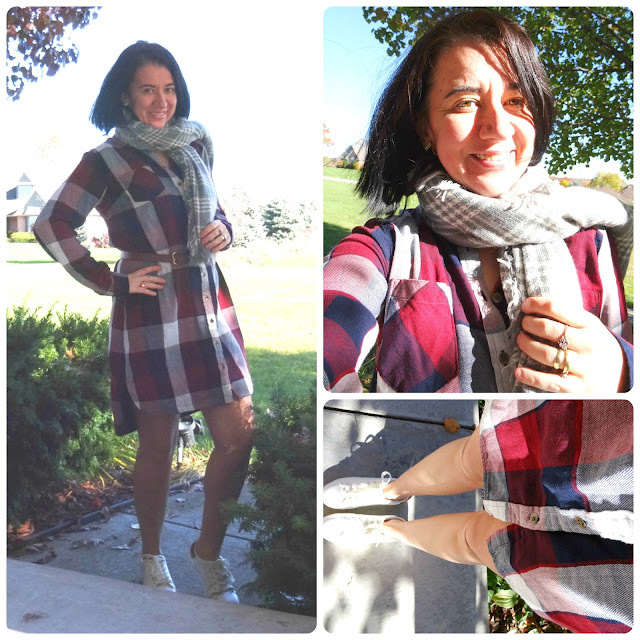 Neutral Gray Plaid Blanket Scarf with Burgundy/Cream/Navy Plaid Shirtdress and White Leather Sneakers. Last but not least I wore my Plaid Blanket Scarf with a Plaid Shirtdress. Plaid with more plaid?! Sure, especially for Fall. The trick to this is for one of the patterns to be either smaller, neutral or more subdued. So my scarf is gray and white and it went well and didn't look overwhelming with the Burgundy/Navy/Cream Plaid Dress. I loved this Athleisure Look with the White Leather Sneakers and even got a few compliments on it. Buffalo Plaid Navy/Red/Cream+Burgundy, Long-Sleeve Shirtdress: Merona via Target (New) (identical in several color combinations, Fantastic Deal, love these), (similar, on Sale), (similar, Splurge). Brown Faux Leather Skinny Belt w/ Square Buckle: Old Navy (New) (similar, Huge Steal, love this), (similar w/ intricate design, Steal), (similar, Splurge). White, Soft Leather Stan Smith Look-Alike Sneakers: Target (New) (current option from Target, Steal), (similar, Great Deal, my Favorite), (very similar, Splurge, love these). 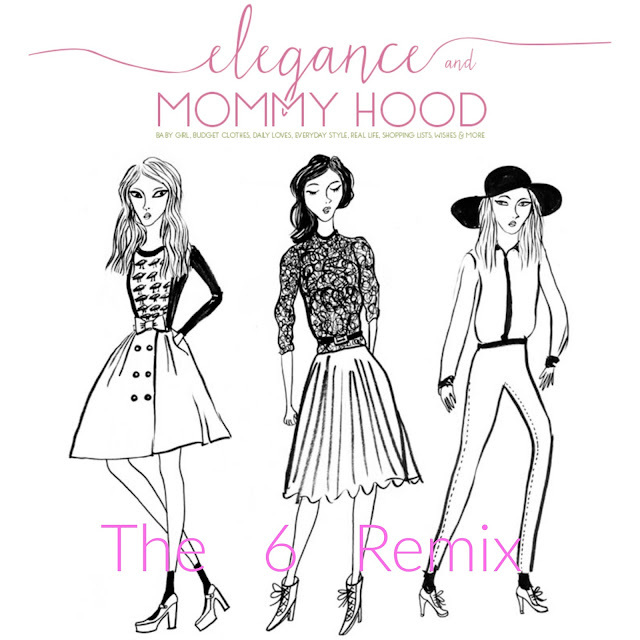 So, which 2 outfits from this remix, are your favorites? My favorites are the one with the striped dress and the one with the chambray dress. Thank you for making it this far. I know this was a very long post. I wish you all a Happy Hump day and I invite you to join my new Thursday Moda linkup for this week. It will be up at 6.00 PM Eastern time!